I actually made this awesome mushroom risotto last week, but have been suffering from an uncharacteristic bout of writer’s block. Plus, when daylight savings time ends and it starts getting dark at 5:30, your become completely sapped of energy after work. Which is why risotta can be such a great fall meal (I’m high fiving myself for that segue). I am a major proponent of simple weeknight risottos; in fact, one of my earliest posts was this risotto with artichoke hearts precisely because it’s so easy. You don’t have to think about cooking times or precise measurements. You just cook, stir, and taste until your rice is tender. 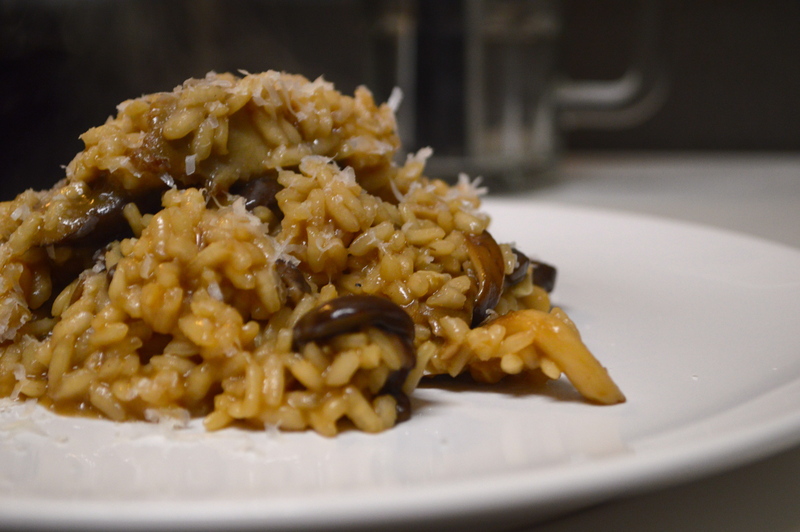 The thing that makes this risotto so good, if you like mushrooms, is using beef stock. Obviously, you can use vegetable stock and keep this vegetarian or even vegan, and just as obviously, I don’t do that. Beef stock pairs really well with the meaty quality of mushrooms and replaces some of the richness of using actual meat while keeping your dinner possibly healthy and definitely cheap. In a large sauce pan, warm stock over low heat. On the next burner, melt butter into olive oil in a large skillet over medium heat. Add diced onions with salt and pepper to taste and cook until softened, about 5 minutes. Add mushrooms to pan and sauté with a little more salt until softened. The mushrooms will give off liquid that should evaporate after cooking for 5-10 more minutes. Add garlic and rice to pan and stir to incorporate with oil and vegetables. Cook until garlic is fragrant, 1-2 minutes. Begin to add stock, a ladleful at a time. Once you add stock, about a half cup every few minutes, begin to stir often. You’ll see the liquid in the pan thicken as the rice releases starch and the grains absorb the liquid. When most of the liquid is absorbed, add another ladleful. When you have used about 3/4 of the stock, begin to taste the rice. It should be tender but still have texture. When the rice suits your taste, your risotto is finished. The whole process should take 20-30 minutes. Grate parmigiano reggiano cheese over rice to taste. Eat while wrapped in furs and drinking mulled wine in front of a crackling fire.